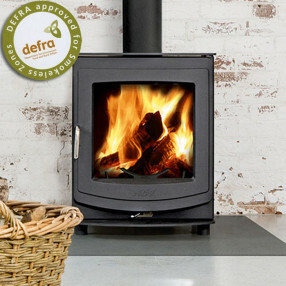 The AGA Ellesmere 6 multi fuel and log burning stove is the largest in the Ellesmere collections. The product is a great choice for any medium to large sized living room. Its design blends traditional with contemporary whilst keeping the timeless look of an AGA product. The Ellesmere range are styled with clean lines and an excellent viewing window, the simplicity of the primary and secondary controls also make the 6kW AGA Ellesmere user friendly and easy to control.